How Pvt. Paschal Parkman might have looked. This letter was written by Paschal Piola Parkman (1836-1869) to his wife, Mary Adelia (Parker) Parkman (1842-1874) of Philo, Champaign County, Illinois. The couple were married on 17 February 1860 in Champaign County. 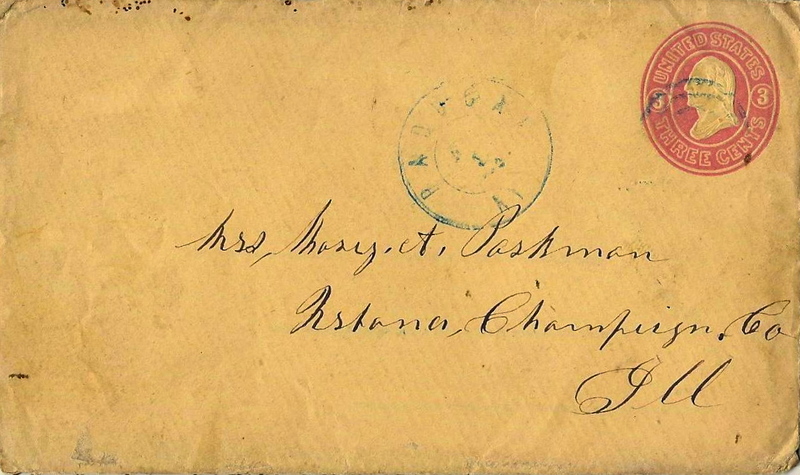 In the letter, Paschal mentions their young daughter, Emma Sarah Parkman (1861-1919), whom her fondly calls “the little witch.” Paschal’s parents were Chauncey Parkman (1798-1869) and Harriet Tidd Wilkinson (1801-1883) of Franklin County, Massachusetts. Mary’s parents were Ebenezer Warren Parker (1813-1897) and Chloe Allen Parmenter (1817-1892) who came from Worcester County, Massachusetts to Philo, Champaign County, Illinois in April 1856. 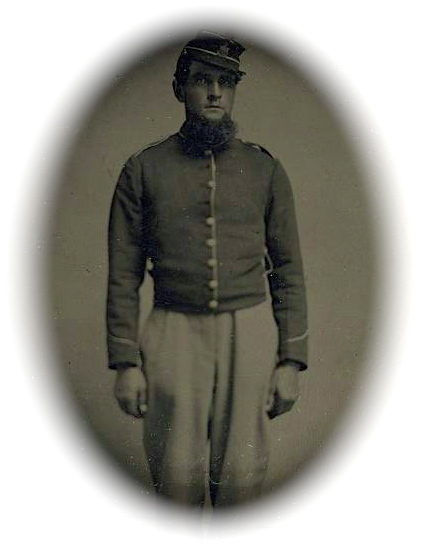 Paschal enlisted as a private in Company I, 2nd Illinois Cavalry in August 1862. He mustered out of the service two years later as a sergeant. Company I saw service in the western theatre of the war. Uours of January 30th I received this morning. I thought I would answer it, I hope you will excuse my writing so often for I expect soon to be in active service & then I can’t write so much so I will improve my leisure moments for if my letters gig you as much pleasure as yours do me, I shall consider my time well spent. I am much obliged to you for your sympathy. I know that you think of me often & would gladly share my hardships if it was possible but I don’t think it best for you to expose yourself. It would do me no good to see you exposed to hardships but if ever it is my misfortune to be wounded or in any way need your care, I shall most gladly avail myself of your kind offer. I trust the time is far distant when I shall stand in need of such service. I would not mind a few scratches but I ain’t very particular about losing a leg or an arm, yet there is no telling what will happen. I shall endeavor to take as good care of my health as circumstances will admit & leave the rest to take care of itself. The life of the soldier is a life of danger on every hand yet he soon becomes accustomed to it & takes no notice of things that would startle & make a man not a soldier turn tail. I know that such has been my experience. I have seen & known of things that have happened since I have been in the army that had I been at home would have excited me very much but hear I take no notice of them, consider them a matter of course, & let them go as such. I don’t know whether these influences will wear off when I get out of the army or not but I expect they will — at least I hope they will. There is at present considerable sickness at the Post. [Lt.] Albert T. Hall is in the hospital. He is pretty weak but not dangerous so. I think he has been sick some time but has been in camp until with us a few days. It was so wet and muddy he thought he had better go to the hospital for a few days. This company has been very lucky so far. We have not lost a man except that one that was shot. I have reason to be thankful for the good health that I have had thus far. I feel first rate now [and] have a good appetite. In short, I get along. Melley, I wish I could see you and the baby — the little witch — how I want to see her. You have reason to be proud of her for I think she is about as smart as children usually are. She must look cunning, running about cutting up all manner of shines as I know she does. Well take good care of her & yourself, my dear, & when I come home we will have a nice time. I should think you must have some rain as well as we by what you say. A thunderstorm in the winter is something unusual & such a lone as you say that you had must have been awful. We have had a large quantity of rain here & it makes it very uncomfortable for us. The mud & rain together is rather more than one phase. Last night it froze a little for the first time in a good while & it seems nice to go round and not get my feet muddy. I hope we shall have good weather soon for I am getting tired of such as this but I don’t think we shall. It is trying to snow now & I expect it will turn to rain soon & wet everything again. Well, let it come. I guess I can stand it as much as the best of them. I am sorry about this sheet. It looks like ugly but I can’t help it now. Let it go. I guess you can ___ it out. Respects to all enquiring friends & love to you, my own dear Mary, From Paschal.